The above current plots doesn't tell me anything. As you can see the fast recovery time of 1N4148 can be seen very explicitly. What is the proper way to check reverse recovery time in LTspice/SPICE? I mean what should be the rise and fall times relative to the squarewave period? And how is that measured in real(the one we see in data-sheets)? In LTspice, setting the rise and fall times of a pulse source to zero will not mean that they will be null, as that will be both a physical impossibility, and a machine problem -- a low and a high cannot coexist in the same time. So, LTspice circumvents this by setting them to 10% of the Ton. In your case, you have Tperiod=10u and Ton=5u, which means that Tfall/Trise will be 0.1*Ton=0.5u. This also means that the total pulse width, calculated from the time it reaches 50% of the rising time, until 50% of the falling time, gets to be Ton+(Trise+Tfall)/2=5u+(0.5u+0.5u)/2=5.5u. The solution is to impose values for Trise/Tfall, but in a sensible way. For example, a 0.1% or Tperiod will, in most cases, suffice, while also not be a burden to the solver, by creating unnecessary steep transients that may cause slow downs around those points, or even failures in the form of timestep too small. Adapting this to your requirements: 0.1%*Tperiod=10u/1000=10n (the values you have chosen, congratulations). 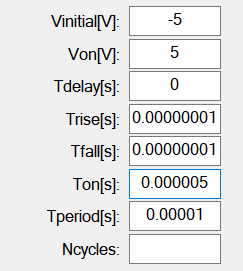 Now, to account for the total pulse width (considering Trise=Tfall): Ton=Ton-Trise=5u-10n=4.99u. If, for example, Trise=2*Tfall=20n, then the pulse width would have been 5u-(10n+30n)/2=4.98u. Of course, nobody says you can't set Trise=Tfall=1ps, or less. LTspice will comply, but, as mentioned, you may regret it. One last thing to mention: LTspice uses a modified nodal analysis for its matrix solver, so that means it's working with conductances (1/R), rather than resistances (R), which also means that voltage sources, with their default (machine) zero resistance, may cause problems (as mentioned by the manual, see the E-sources, bottom). LTspice's solution for this is the parasitics, Rser and/or Cpar, but Rser is the one that matters. When set, it will be converted, internally, into a current source, thus having much higher chances of convergence. For your case, it's unlikely this will be needed, but it's not a bad thing to remember. Also, since you manually inserted series resistances, this will, most probably, not be necessary. So, with these in mind, you can test your diodes as you see fit. You may want to impose a tight(er) timestep, while also only using a period, or two (no need for more). .opt plotwinsize=0 may also be of a help in studying short periods of time with the waveform viewer. If you want to compare two different diodes, do not put them both in the same circuit. Put in a second power supply, pulse generator, etc. 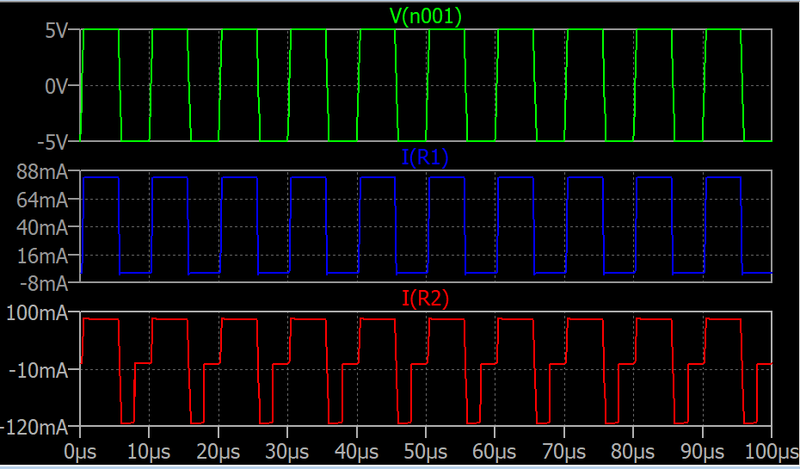 and only have the oscilloscope common to both circuits (each test circuit gets its own channel/trace). You may also have to adjust the supply voltages depending on the diode. The one below is designed mainly for higher power didoes, not the 1N4148. This is usually what is used to obtain the values included in the diode datasheets. Not the answer you're looking for? Browse other questions tagged ltspice spice reverse recovery or ask your own question. What is the reverse recovery time in a diode? 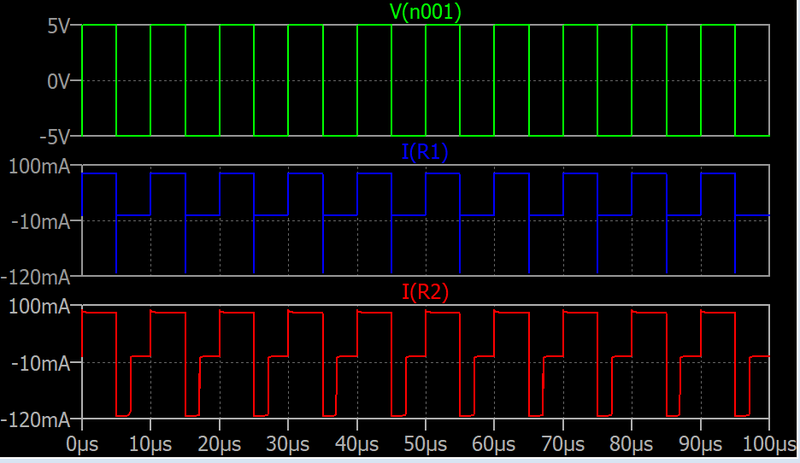 Simulating SMPS with ideal switch in LTSpice? 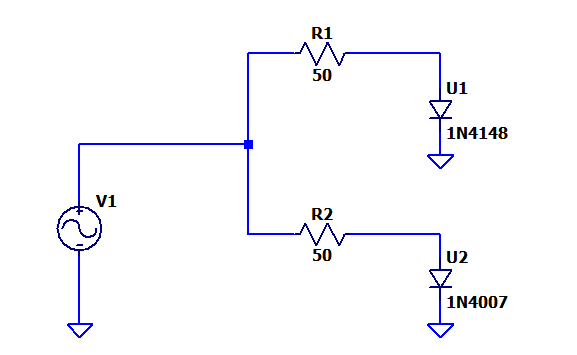 How to model a noisy Zener diode in LTSPICE? LTSpice: Can I vary schematic temperature over time?